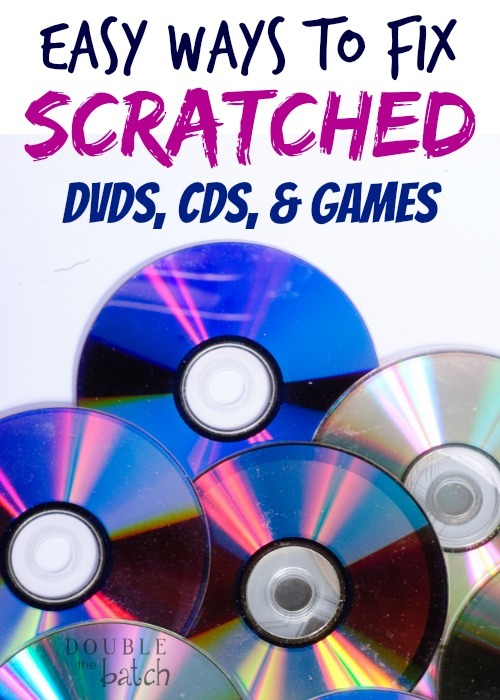 If you have kids, you have scratched DVDs, CDs, and games. It is just a fact of life. I actually have an extensive collection of VHS movies because a dvd doesn’t seem to last longer than a month at our house. I have been de-junking my house, and I was trying to decide if I should keep all these scratched dvds or throw them out. I started searching online to see if there was any hope for them. What I discovered was that there was, in fact, hope for them and so I gave a few of the ideas I found a try to see if any of them could save my dvds from what otherwise would be an early and certain death. I’m hoping I can save you hours of searching and testing with my review of what to do with your scratched dvds, cds, and games. Here are the things you can try to save your discs and the order in which I would try them. I start with the least invasive techniques first and then move on to the next least invasive if it doesn’t work. First, there is a whole lot of talk about toothpaste on the internet being a cure for disc scratches. I used car wax instead as it made a little more sense to me. But, whatever you have on hand, the first thing you should try is rubbing it on your disc from the center out, working your way all the way around the disc. Let it dry (5-10 min.) then wipe it off from the center out using the same technique you used to apply it. Rinse it with water and wipe it clean with a t-shirt like cloth. Second, if this doesn’t work, try wiping a stick of white deodorant (NOT gel) from the center out all the way around. Let this dry for 5-10 minutes, rinse it by running it under water and using your fingers to wipe from the center out all the way around until most of it is off. Then dry it using the same technique with a t-shirt like material. Third, if this doesn’t work, repeat the two steps above and see if you get any results. I had success after applying both carwax and deodorant to my dvds. They weren’t perfect, but they improved greatly and were definitely watchable again. I’m going to keep repeating the steps to see if I can get an even better result. Here is a video demonstrating this technique that I found helpful. You can also try Scratch Out! found here. This video gave some great tips on using it. He had success, but it took a lot of effort. Fourth, if you don’t have success with these techniques, you can try resurfacing the disc. I tried doing this by hand after reading this and watching this. I did not have success, but I didn’t have all the same products they used, so I am going to try again once I get the same products and I will update you with my results. I only had 2000 grit sandpaper and car wax. You can get 3000 grit sand paper here and the Meguiar’s compoud he talks about here. I would only try this on a disc that is so bad that you will throw it away otherwise and definitely only after not having success with the tricks listed above. Fifth, if you are afraid to try sanding yourself, the SkipDr found here will resurface them for you. It is fairly inexpensive and got good reviews online. Stick with the manual version I linked to- it had better reviews than the motorized. Or, if you really wanna get serious about this, you can purchase the JFJ Easy Pro Universal CD/DVD Repair Machine here. It is more expensive, but has even better reviews and a higher rate of success. Finally, if nothing else works for you, you can see if any of the gaming or video stores in your area offer resurfacing services or you can mail-in your disc here and they will do it for you, but rates vary and it isn’t the cheapest route, of course. I hope this has been helpful! Good luck in your efforts to resurrect those scratched discs!